I knew my rear alignment wasn’t ideal for sure, I had to crank in some extra camber just to get out of my driveway without rubbing the rear arches. The Bridgestone S-04 Pole Positions I had installed when I went to a square setup were much wider than the previous Hankook V12s or Continental Contact3’s that I had, even though all were 245/40R17 (stock rear size.) I even had a slight roll of the rear fenders and slightly raised the ride height. Despite this, I still rubbed on compression when I took the car to MSR-Houston. The extra negative camber in the rear was more than ideal and was surely upsetting the balance I had dialed in. More concerning was the apparent toe-in that had come in, so much that it was visible to the naked eye. Unfortunately I was in the middle of a move from Texas to South Carolina and simply didn’t have time to solve the problem. Even if I had, I’m not sure I would have completely avoided a little rubbing. I’m sure the excessive toe-in might have had something to do with it, as the rubbing was at the rear of the arch near where the plastic bumper cover meets the sheet metal. The rear set of young Bridgestones were corded along the inside tread. No point in pressing on with these tires. The fronts still had some life in them, but given that the RE-11s on my M Coupe didn’t fair much better with a good alignment, I decided to change to something else. 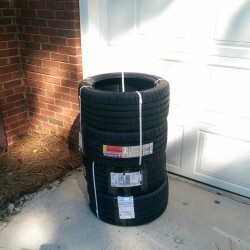 The Michelin Pilot Super Sports had come down in price and had been very pleased with their performance on the M Coupe at Circuit of the Americas, so I ordered up a set of 245/40R17s. Interestingly, the S-04s measured out at 9″ tread width and the Super Sports measured 8.5″. That extra 1/2″ (well 1/4″ on the outside) would surely help my rubbing issue. 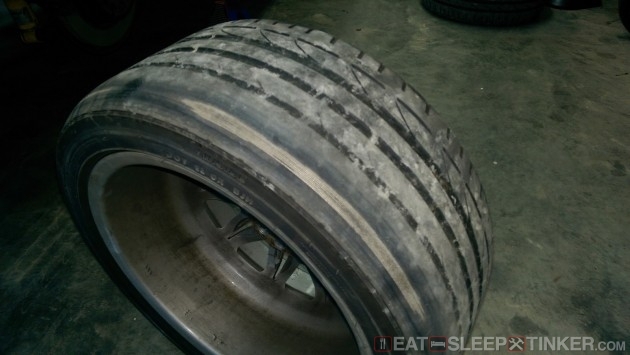 They are also 3 lbs lighter and score higher in every category at TireRack.com. Of course I didn’t want to ruin another set of tires, so an alignment was in order. 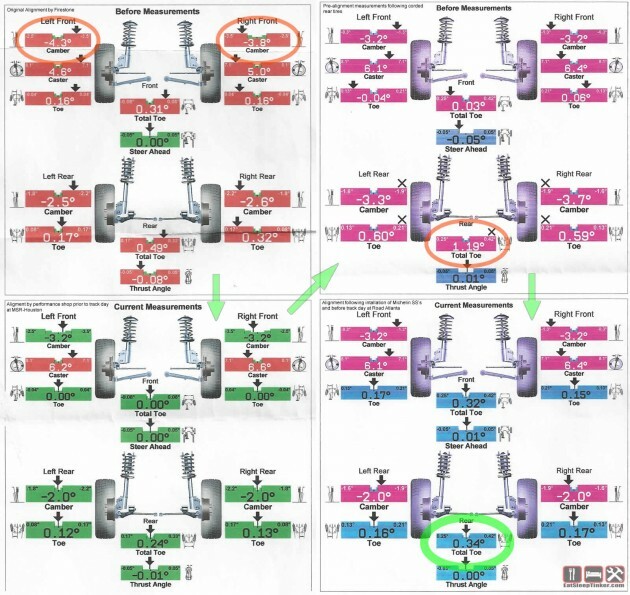 I found a local shop that was willing to match my specified settings and seemed comfortable working on a car with camber/castor plates and lower adjustable control arms. I gave them the print-out from last successful alignment; roughly max castor, -3.2 front camber, minimum toe, -2 rear camber and just a smidge of toe-in. The image below is a scan of the previous alignment and the latest one. The upper left figures are from a Firestone chain shop, that was the best I could get out of them. I’ve since sworn off using them. I’ve highlighted the variances they dialed in, and this was with proper camber plates that make adjustments very easy. The lower left is from a speed shop who really were able to get the settings bang-on. The upper left is the measurements following my fiddling with the rear to fit the over-sized S-04 Pole Positions. As you can see, there was an excessive amount of rear toe-in. That combined with the large amount of negative camber is what led to the rear tires cording.